The Beach: It's no secret that I am a big fan of beaches. You will see some beautiful waters here and get an amazing sunset. I’ve seen many sunsets in many places. This one was my favorite to catch. People will be on the beach playing soccer or volley ball enjoying life. Vendors stop people to sell items but they are not very persistent like I’ve seen in other places. 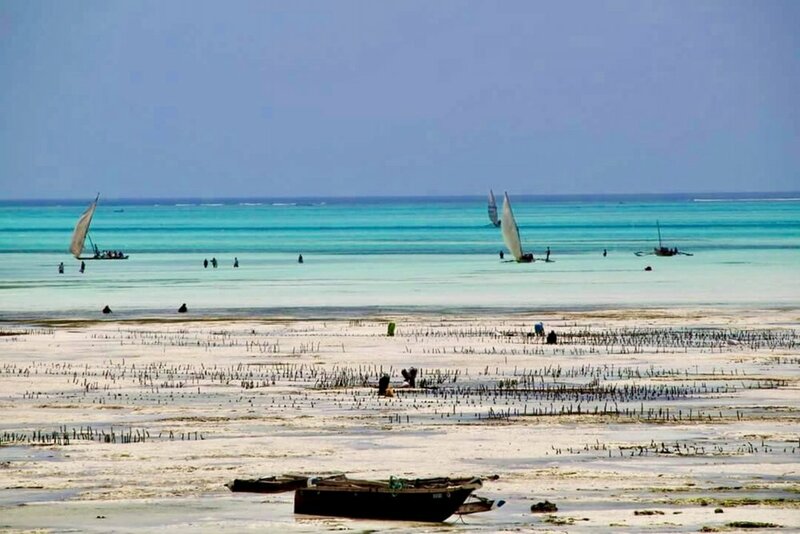 Nungwi is the most popular beach of Zanzibar so you will see many tourists and locals here alike. My hotel was located on Jambiani beach which to me wasn’t as favorable as Nungwi but it was much less crowded. Prison Island: A top favorite of beautiful waters for me and a great historical learning experience. I learned the purpose of Prison Island was to be a jail for rebellious slaves. No prisoners were ever housed here as it became a center of quarantine for yellow fever outbreaks. On Prison Island you can go for a swim on the beach, catch some great views of the horizon and feed the tortoises. This tour will cost you around $30. Stone Town: As a lover of architecture, I must have stopped and observed almost every door. The doors of each building were so captivating (I loved the spikes). Walking through here reminded me of a maze that I loved getting lost in. The streets are rather narrow and in many cases it might be a bit hard to navigate through if you’re walking alone. The people here are very helpful and speak very good English so you will find your way. You will also find some beautiful souvenirs here and great art work by local artists. I purchased 2 paintings for reasonable prices (less than $50 each). The Spice Farm: My favorite part of the island by far. I have a very strong interest in natural foods and a plant based diet. So when I had the opportunity to visit one of the many family owned spice farms I jumped right on it. I wasn’t sure what to expect. I assumed it would just be someone telling us about the spices and selling them. I had no idea the treat I was in for. All of the fruits and vegetables that I search high and low for at farmers markets were all here growing from the ground or on trees the natural way. I was in awe to see basil, avocados (they weren’t in season yet), oranges, pineapples, bananas and many more in their natural form. Visually, the fruits here are significantly smaller than they are in the states. They also have more flavors when tasting them. Ex: I struggle finding good oranges. This one orange in Zanzibar was the best orange I’ve ever had. And strangely enough, the orange itself was not the color orange, it was yellow. Marsala, passion fruit, lemongrass, ginger and Iodine are a few other things we saw here. I purchased several spices and lotions all made naturally on the farms. This was my favorite experience of the entire trip. The Spice Farm tour costs about $40. It includes entrance fees, lunch, a full tour of the farm, and water. Spices, lotions and creams are also available to purchase for extremely reasonable prices (about $5 each). The food here was amazing. I loved the variety of plant based options. The food reminded me Indian food which happens to be one of my favorite cuisines as I could taste the curry style seasonings. Slave Memorial & Chambers: The monument is located in Stone Town. It is life size statues of slaves in shackles to represent the old slave market in Tanzania. Standing in this chamber made me very emotional. It was about 1/4th the size of an average bedroom. The wood that was used for the slaves to sleep on didn’t even look like humans could belong there. The room was so tiny. The chambers were dark, underground, and practically airless. This is where slaves were stored before they were sold to owners. I’m 5’5 and I could barely stand straight in this room as my head practically touched the ceiling. It cost about $5 to enter the chambers. The People: Zanzibar is a predominately Muslim place and the language spoken is Swahili. But almost everyone also speaks English. 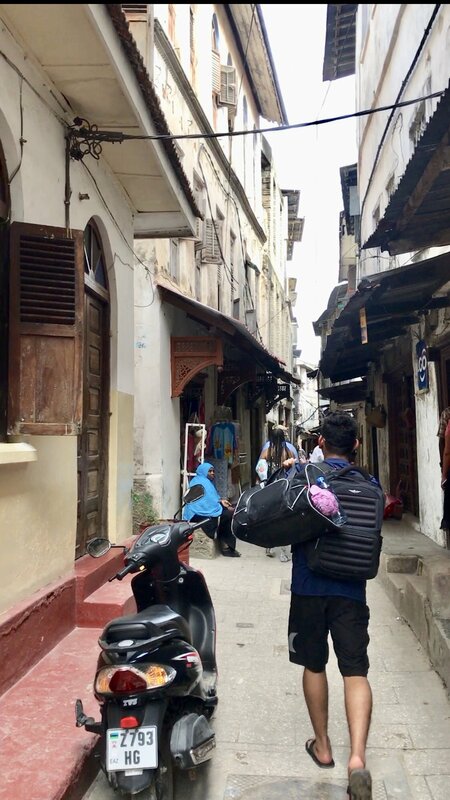 When visiting busy areas like stone town, it is recommended that women dress more modestly. The women were mostly covered (only thing you could see was their faces) and so were the little girls. I noticed that some women were covered in traditional African designed fabric with vibrant colors/patterns while others were covered solid/plain fabrics that I have mainly seen on traditional Muslim women. I wasn’t sure what to expect on how I would be treated but they treated us nicely. It was wonderful to go somewhere and see so many people who shared your skin tone and hair type. Jambiani Villas: We stayed in Jambiani Villas and loved the experience. A 2 bedroom, 2 full bathroom, balcony and outdoor shower With the beach in your backyard, a pool and good service I had no complaints. Just like Countless other places, you can be in a luxurious area in 1 minute and drive no more than 7 minutes and be in a totally different place. This disappointed me because the money invested to build these 4 and 5 star villas could have be used to rebuild some of the people’s homes. I noticed that there were run down homes very close to our villa as well. Aside from this, our resort was beautiful and the staff was extremely helpful. The Rock Restaurant: This place is on many people’s radar. It looks exactly how it sounds. I dreamed of coming here. The views of the water were spectacular. Our reservation was just before sunset which made it so much better. It wasn’t very hot and the view of the sky along with the calm waves was surreal. The ambiance of the restaurant was beautiful inside and out. It's a little tough to get to the entrance because the rocks are kind of sharp (be careful). I will be honest and say the food wasn’t great especially for the price we paid. It’s a bit pricey compared to the other food we’ve had (Paid about $65 per person). But overall the ambiance made it a great dining experience. A visa is required to enter Zanzibar. For American Citizens the cost is $100 and it can be purchased at the airport. The yellow fever vaccination is only required IF you are traveling from places known to be infected with yellow fever (ex: Kenya). US citizens traveling from the US are not required to get the vaccine. Note: I traveled to Zanzibar from Nairobi, Kenya and not the U.S. therefore I was required to get the vaccine. It cost $50 at the Zanzibar airport. Electric Outlets are European style so break out those converters! Spice farm: there are many family owned spice farms in Zanzibar. 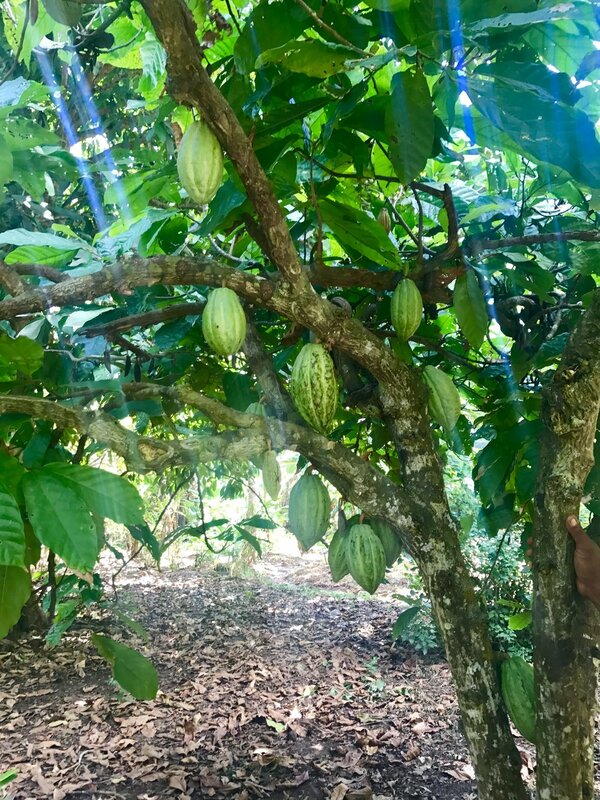 Here is the one I visited: Kizimbani Private Botanical Garden & Spice Farm. You can exchange money at a local bank in Stone Town. However I recommend exchanging money at home prior to your trip. There were always negative stereotypes of Africa that I have seen prior to visiting. The visions of Africa always represent poverty, wild animals, corruption, etc. I'm happy to have visited Zanzibar and experience its beauty and culture. I'm sure many other countries in Africa break these negative stereotypes and I cant wait to explore the beautiful land where civilization originated as well as natural resources. The spice farm I visited inspired me to do more research into the food I put in my body. GMO's are a big thing in the states so it's important we try to find as much natural foods as possible. I've even considered looking into possibly growing my own food after this trip. I'm glad to have shared this information with you and can't wait for you Walk With Ms. Walker on my next adventure! Cuba - Welcome To Havana !